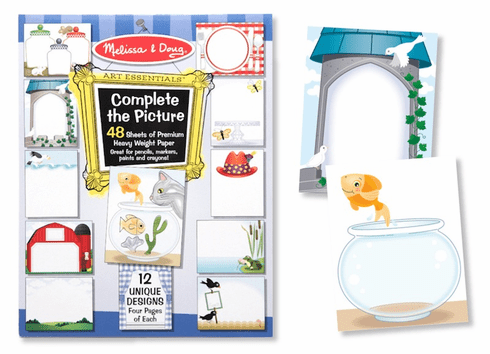 Create unique and colorful masterpieces with the Melissa and Doug Complete the Picture Pad! Each sheet in this pad features a colorful, unfinished scene just waiting to be filled in! Draw a princess in the empty tower, animals in the empty barn, fish in the fish bowl, and more! Each booklet includes 48 sheets of premium, heavy-weight paper. The pages are perfect for pencils, crayons, markers, and more!